Diego Maradona has dismissed the decision to award Lionel Messi the World Cup's Golden Ball as a "marketing plan". Diego Maradona has criticised Fifa for awarding Argentina’s Lionel Messi the Golden Ball award for the World Cup’s best player. 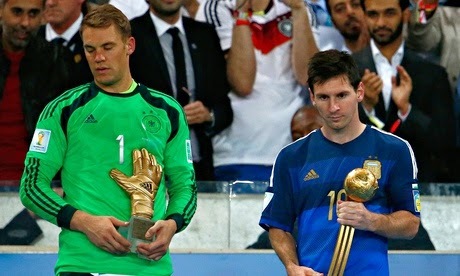 Messi was presented with the award after his country’s 1-0 defeat to Germany in the final in Rio, beating such stellar performers as Arjen Robben, James Rodríguez and Thomas Müller. Despite scoring four goals in seven matches, the Barcelona star was not at his best during the knockout stages and Maradona dismissed the decision as a “marketing plan”. Maradona also criticised the Argentina coach Alejandro Sabella’s decision to substitute Ezequiel Lavezzi for Sergio Agüero at half-time in the defeat to Germany. “I don’t understand the substitution of Lavezzi. He was phenomenal down the wing. Kun Agüero didn’t have the same impact. It was not his tournament,” he said. Messi missed a golden opportunity to give Argentina the lead early in the second half before Mario Götze’s winning goal in extra time and admitted he was devastated not to have led his country to a third World Cup triumph. “Right now I don’t care about the prize. I don’t care about anything. I wanted to take Argentina to the World Cup for all the people,” Messi told Spanish newspaper AS. “We deserved it a bit more after the game we played. It’s very painful to lose the way we did because we were near penalties. “I believe this World Cup deserved another final because we had chances.